Rumbling down Interstate 69 on a crisp fall day in Michigan, a mixed convoy of military and commercial trucks using autonomous vehicle technology snaked its way through Port Huron across the picturesque Blue Water Bridge into Canada and back. Led by a team of U.S. Army and Auburn University researchers, the convoy demonstrated the capabilities of truck platooning technology for a crowd of dignitaries and the automotive press corps gathered at the U.S.-Canada border. The history-making trek in October 2017 was the first international border crossing conducted by the U.S. Army Tank Automotive Research, Development and Engineering Center, or TARDEC, using the rapidly advancing technology. Truck platooning is increasingly seen as the future of freight transport with myriad other applications as well. 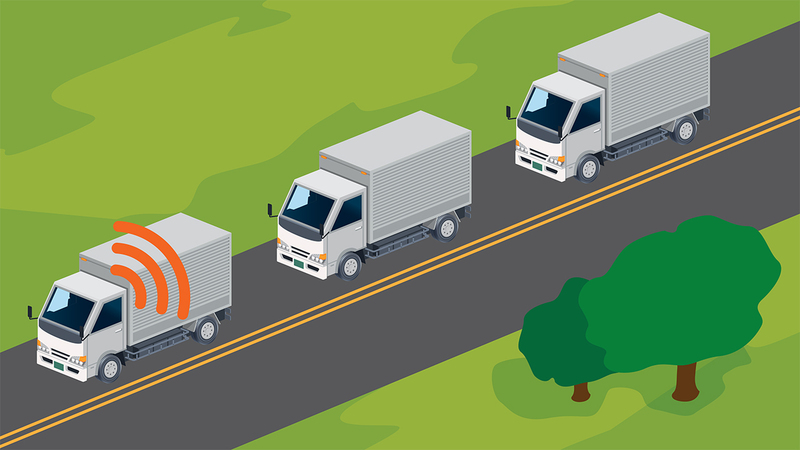 Using vehicle-to-vehicle wireless communications technology and sensors, two or more trucks can link together and maintain a set, close distance between each other automatically. When the lead truck accelerates or decelerates, so do the following trucks. As the Blue Water Bridge demonstration and subsequent testing on I-69 have shown, this technology offers the promise of increased fuel efficiencies, decreased traffic congestion and improved safety for truck fleets. 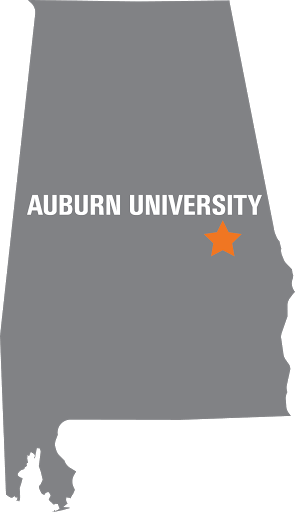 “Truck platooning systems could have large benefits in the trucking industry for both commercial and military applications,” said David Bevly, the Bill and Lana McNair Distinguished Professor of Mechanical Engineering and director of Auburn’s GPS and Vehicle Dynamics Laboratory. Since joining the Auburn Engineering faculty in 2001, Bevly and his team of GAVLAB researchers have been at the forefront of research on vehicle dynamics, navigation and control. The lab’s expertise in this area has made it a natural partner for organizations engaged in autonomous vehicle research and development, such as TARDEC and the Federal Highway Administration. Bevly and his GAVLAB team have been at the heart of a $1.42 million FHWA project to evaluate the commercial feasibility and benefits of driver assisted truck platooning, or DATP. It is a form of cooperative adaptive cruise control for two-truck platoons. Other project partners include Peloton Technology, Peterbilt Trucks, Meritor WABCO and the American Transportation Research Institute. The project has consisted of development and testing of DATP, as well as stakeholder engagement and business case analyses in the trucking industry. The team’s findings have supported their theory that truck platooning technology is near market ready and will provide significant value to the industry and fleet owners. As part of the project, the GAVLAB team conducted initial fuel testing at the Transportation Research Institute’s test track in Ohio using Peloton’s prototype truck platooning systems. The GAVLAB team has gone on to develop its own algorithms used in recent testing at Auburn University’s National Center for Asphalt Technology test track, as well as the demonstrations on the Blue Water Bridge and I-69 in Michigan and I-85 in Alabama. GAVLAB-developed algorithms and software operated all four trucks in the mixed military and commercial convoy on I-69. Data from these tests showed that peak fuel savings for the platoon was 6.96 percent at a 30-foot distance, and peak fuel savings for the following truck was 10.24 percent at a 50-foot distance. Even at a 75-foot following distance, the tests showed that truck platoons can yield a 10.11 percent fuel savings for the following truck and a 5.59 percent average fuel savings for the platoon. Considering that long-haul trucking accounts for more than 10 percent of U.S. oil, and fuel takes up 41 percent of operating expenses for truck fleets, the economic impact is substantial. The system operates by pulling together radar for longitudinal sensing, vehicle-to-vehicle communications for exchanging information between vehicles, satellite positioning for verifying distance between trucks, actuation for longitudinal control of the vehicle and human-machine interfaces for controlling DATP settings. Besides the economic upside, the DATP technology can also vastly improve safety by reducing the opportunity for human error. Highlighting how truck platooning technology can improve safety is a key goal for industry and the military, which was one aspect of Auburn’s October 2017 demo with TARDEC in Michigan. That day, the four-truck convoy consisted of two Peterbilt 579 commercial trucks, as well as the Army’s M915 “line haul” tractors carrying flatbed trailers loaded with cargo containers. “It was really interesting to show interoperability between military trucks and commercial trucks using common communication platforms between the trucks,” Bevly said of the truck platooning demo. For the Army, interest in truck platooning technology goes far beyond fuel economy. With military convoys a prime target for attack in conflict zones, the Army has a vested interest in using as few personnel as possible during transport.